HOW DID YOU GET TO BECOME AN EXPERT IN CLIMATE ACTION COMMUNICATIONS? My post-college work was all about public relations and communications for various associations and businesses. The writing and strategic thinking were what attracted me and what I seemed to have a talent for, right from the start. In the early 2000’s, I saw the still very wide open opportunity to focus in on helping clients understand how to reach the women’s market. In the course of that work, I also started writing about the topic for various online publications, which lead to the book contract and speaking opportunities. By 2007 or so, I’d gotten bored of that topic and was digging more into women and business leadership. It was tuning into Twitter in 2008, and living in a place where many socially responsible businesses launched (Burlington, VT) that moved my focus into sustainability – first looking at “green consumers” but then applying what I knew about how women lead into more broad sustainability leadership. I then pursued a Master’s Degree in Sustainable Business and Communities and my writing in HuffingtonPost and other publications moved in that direction too. In 2015, I had the chance to work with a coalition of non-governmental organizations (We Mean Business) all leading the charge for business-driven climate action around the COP21 climate talks. That year was the pivot point. Ever since, I’ve gotten more passionate about working with nonprofits and NGOs in communicating climate action leadership. WHAT AREAS OF CLIMATE ACTION COMMUNICATIONS ARE YOU MOST PASSIONATE ABOUT? Even before the U.S. administration switched to one that would reverse all climate action policies, I had gotten excited about how much power the cities, states and regions could have – beyond that of nations – in addressing climate change. So, in Twitter hashtag terms, my personal passions are #cities4climate and, on a more detailed level, with regard to its power to reduce GHG emissions , #bikes4climate . As an aside, I have been putting a lot of pro bono work into amplifying the social impact of an incredible music nonprofit that is based in Seattle, but streams globally (and has a global impact) – KEXP.org. My thinking behind that is that helping humans find solidarity or common ground in music discover and appreciation can be the foundation from which we then tackle issues like climate change. One day, I’m hoping to have helped build a curation of #music4climate information and insight, so stay tuned. 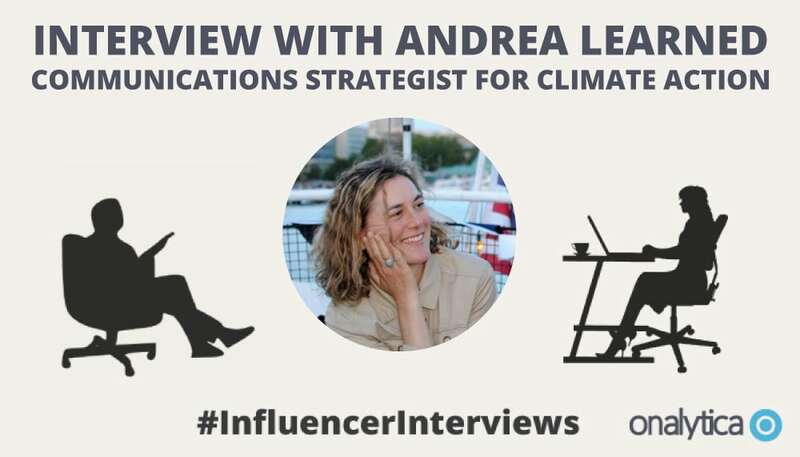 WHICH CLIMATE ACTION INFLUENCERS INFLUENCE YOU? OUTSIDE OF CLIMATE ACTION WHO ELSE INFLUENCES YOU ? Harvard Business Review – I continually learn from and share leadership articles I read there. Brent Toderian – as an (almost) life-long bicycling as transportation fan, I’ve long been an armchair fan of urban planning and infrastructure. Brent Toderian does a wonderful job on Twitter, sharing what he’s learned in very accessible ways. Per my comments in an earlier question, the power of building community for social impact is another keen area of interest. What I see happening at KEXP, and where that community can take us on a wide topic of human rights issues (as well as climate) is ENERGIZING. So, thought leaders on social impact and community engagement are other topics I follow. Journalists in a wide range of topics. I learn so much from the scientists and environmental writers I’ve come across in my climate action focus work, and that informs the whole of my life otherwise, too. WHICH BRANDS OR PRODUCTS STAND OUT FOR YOU IN CLIMATE ACTION? This is a hard one because I have a belief that “products” as such are not an answer, but helping people realize they could probably consume a LOT LESS than they do is. So, I’m a fan of Patagonia – because they were first to emphasize buying fewer items, but higher quality – and are known for a campaign they started called “Don’t buy this jacket”. On that note, I appreciate that Subaru emphasizes love of their product (and so, loyalty even in the very old, well maintained vehicles – like the one I own, a 21 year old Outback) has formed a community of passionate fans. They may not be leading as much as I’d love with regard to alternative fuels or electric models (yet?! ), but I value that they make a super solid product so you will not have to buy a new one for many, many years if you treat it well. I dream of using whatever platform I’ve built on Twitter and LinkedIn to align with and amplify things like those I mentioned above – what cities are doing, what bikes can be, what a smarter approach to community and social impact could REALLY DO, especially around climate. I’m an audio fan – having formerly done some sustainability commentary for Vermont Public Radio when I lived in Vermont, and now, because I see the power of the incredible programming at KEXP. I’d love to be interviewed on podcasts or become part of a podcast team around cities and climate action. I’d love to moderate panels of amazing women climate leaders, especially, as their time has come and I have such deep history on their power as leaders. And, I love to help jumpstart content/new series or a new approach to building leadership using Twitter. I’m a jumpstarter by nature, and have found those I’ve worked with gain as much (or more) from my energy and enthusiasm as from the content and strategic understanding I offer. One: make sure my style/voice works for you before you even contact me. Follow me on Twitter or read some of my archives (learnedon.com ). I may not be for everyone. I’m pretty direct and to me it is all about “loving up” the innovative and progressive concepts in climate action as a whole. I don’t enjoy working with organizations that remained convinced that they have to be super competitive. In climate action, a rising tide HAS to lift all boats. Two: drop me an email andrea@learnedon.com or connect via LinkedIn.